Early rain cleared off as the Miss Hampton II was boarding, and the weather continued to improve for a terrific evening of smooth and comfortable cruising around the Hampton Roads Harbor. Forty-two attendees enjoyed an excellent “Southern Style” dinner catered by the Crown Plaza Harbor Hotel in Hampton. 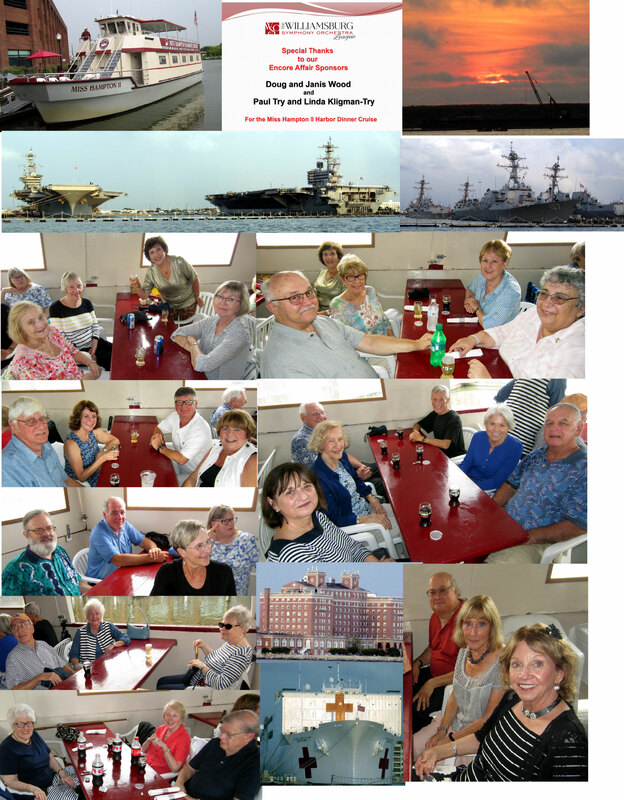 The narrated cruise focused on the history of the bay and included many details about nearly each ship we passed at the U. S. Naval Base (world’s largest). There were an unexpectedly large number of ships in port preparing to evacuate the next day due to the approach of Hurricane Florence. The narrator (ex-Navy) was extremely well versed on each of the different Navy ships and their armament as well as the port facilities. He even included Blackbeard’s history in his expert harbor narration. The weather provided a beautiful sunset backdrop for the fine food and drinks. It was a great start for our Encore Affairs 2018-2019 Season with this Harbor Cruise arranged by Doug Wood and sponsored by Doug and Janis Wood along with Paul Try and Linda Kligman-Try.